Firefly Cinemas made it onto the front page of the Upper Hutt Leader this week. Read the article below. 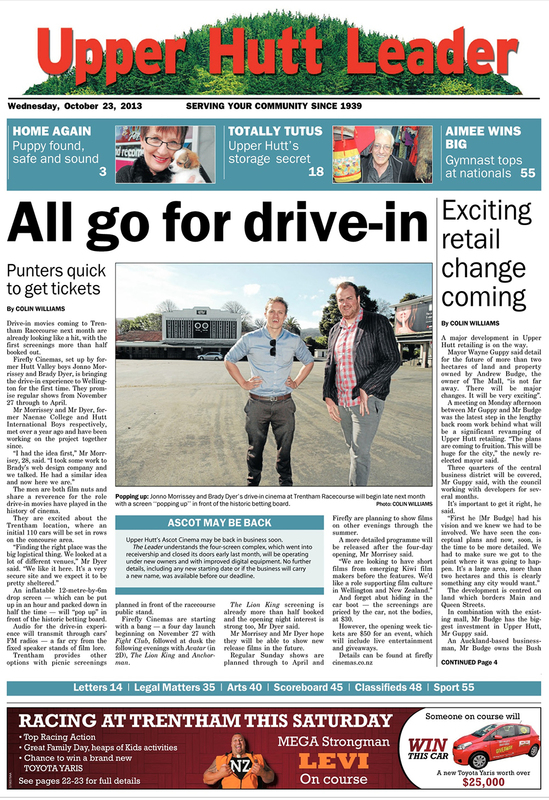 Drive-in movies at Trentham Racecourse next month are already looking like a hit, with more than half the tickets to the first screenings already snapped up. Tickets are for the carload and there will be space set aside for 110 vehicle on November 20 for the screening of Fight Club and Avatar. Firefly Cinemas, set up by former Hutt Valley boys Jonno Morrissey and Brady Dyer, is bringing the drive-in experience to Wellington for the first time. They promise regular shows from November 27 through to April. Mr Morrissey and Mr Dyer, former Naenae College and Hutt International Boys respectively, met over a year ago and have been working on the project together since. The men are both film nuts and share a reverence for the role drive-in movies have played in the history of cinema. They are excited about the Trentham location, where an initial 110 cars will be set in rows on the concourse area. An inflatable 12-metre-by-6m drop screen – which can be put up in an hour and packed down in half the time – will “pop up” in front of the historic betting board. Audio for the drive-in experience will transmit through cars’ FM radios – a far cry from the fixed speaker stands of film lore. Trentham provides other options with picnic screenings planned in front of the racecourse public stand. Firefly Cinemas are starting with a bang – a four day launch beginning on November 27 with Fight Club, followed at dusk the following evenings with Avatar (in 2D), The Lion King and Anchorman. The Lion King screening is already more than half booked and the opening night interest is strong too, Mr Dyer said. Mr Morrisey and Mr Dyer hope they will be able to show new release films in the future. Regular Sunday shows are planned through to April and Firefly are planning to show films on other evenings through the summer. A more detailed programme will be released after the four-day opening, Mr Morrisey said. And forget abut hiding in the car boot – the screenings are priced by the car, not the bodies, at $30. However, the opening week tickets are $50 for an event, which will include live entertainment and giveaways.